The Planning and Land Management in Tropical Ecosystem; Complexities of land-use and hydrology coupling in the Panama Canal Watershed is a National Science Foundation (NSF) research project funded with a $2.89 million grant to study water sustainability, land-use management and climate in the Panama Canal watershed. The three-year grant, which began Aug. 1, 2014, is led by Fred Ogden, the Cline Distinguished Chair in UW’s Department of Civil and Architectural Engineering and Haub School of Environment and Natural Resources. Ogden says the new project continues the Smithsonian Tropical Research Institute’s (STRI) Agua Salud project. “We see huge differences in hydrological behavior depending on the land use,” Ogden says. “Last December, we published a paper in Water Resources Research comparing the hydrology of three catchments with the same soil, same topography and same rainfall -- but different land uses. 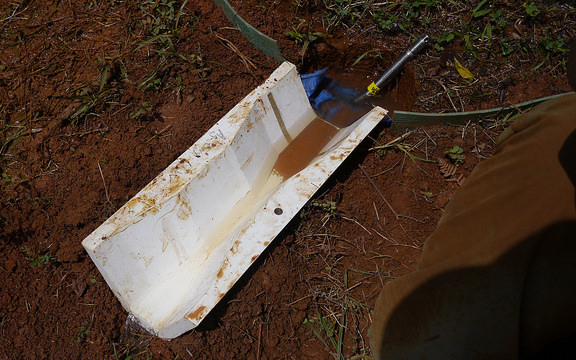 Researchers use a rainfall simulator to examine flow paths and runoff generation mechanisms. 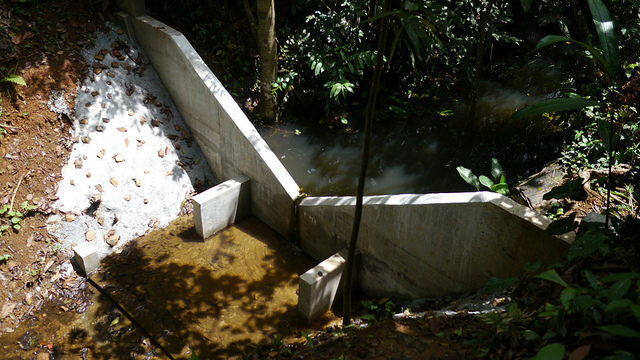 For example, Ogden and his team applied 60 centimeters of rain over three hours using a rainfall simulator in a forest with no surface runoff. The water all infiltrated into the soil. In other tests conducted in a pasture, surface runoff was produced when the applied rain rate was about 10 centimeters per hour. Panama is located in a seasonal tropics zone, meaning the country receives frequent and occasionally heavy rains (sometimes as much as 1 yard in one day) from May through December, with scant precipitation the rest of the year. Ogden says one hypothesis that will be tested is that converting land from pasture to forest will increase wet-season infiltration into the soil and increase groundwater recharge -- which, in turn, will help increase dry-season river flows into the canal and ensure adequate water-depth levels for shipping. It is vital that cargo ships are able to navigate through the canal without getting stuck during the dry season. During December 2010, the canal was closed due to flooding for the first time in its 100-year history. At that time, the culverts that are normally used to fill the locks were opened to help relieve the canal’s undersized spillways, Ogden says. Flooding is a serious concern, Ogden continues. However, more knowledge is needed to understand how land use affects water flow paths in tropical watersheds. 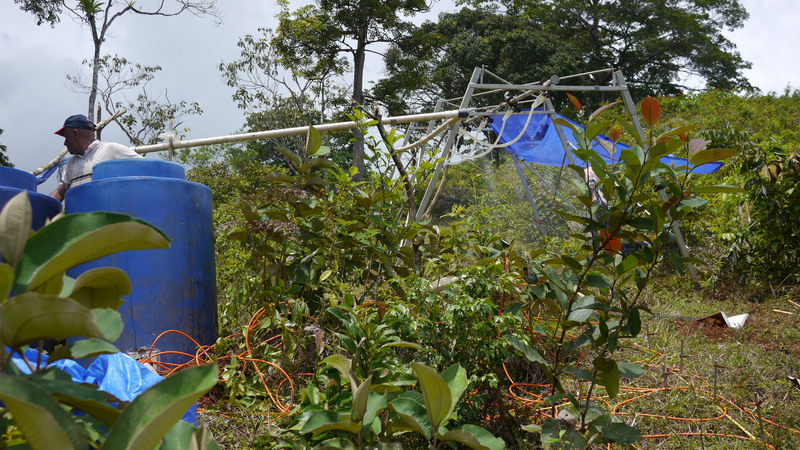 The project team will use a rainfall simulator in a variety of different land uses. 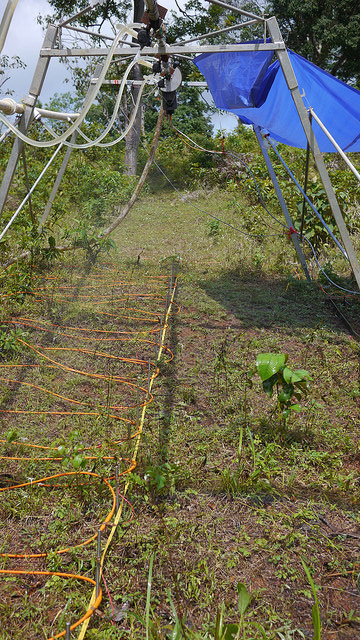 The sprinkler system is used to simulate wet-season rainfall and observe subsurface water flow paths using geophysics. The group also plans to drill deep observation wells to monitor subsurface water behavior, and construct a flow-measuring weir on a 12-acre forested catchment, convert it to pasture, and observe the changes in flow path and hydrologic response. Additionally, the project will use field observations to adapt to unique tropical conditions a computational model Ogden created for the hydrology of the upper Colorado River Basin, and apply the modified model to study future land-use scenarios in the Panama Canal watershed. The high-resolution, physics-based hydrologic model, which is called “AdHydro,” is applicable over large areas to help assess long-term impacts of water resources management decisions, natural and man-made land-use changes, and climate change and variability. Other team members from UW are Civil Engineering Professor Julian Zhu; Brent Ewers, a professor of botany; Ed Kempema, a research scientist; and three graduate students. Other researchers involved with the team are from Yale University, University of Colorado, University of Alberta, the Panama Canal Authority (PCA) and the National Environmental Authority of Panama. The grant also supports new research on landowner and institutional behavior, which will allow researchers to forecast the impact of land use on water flows and work with landowners to achieve optimum land-use solutions. The PCA now pays people to plant trees in the watershed in the hope more water is returned to the canal and to reduce erosion, Ogden says. Ogden, who travels to Panama this week, is a senior associate scientist at the STRI. Located in Panama, the STRI is a bureau of the Smithsonian Institution dedicated to studying biological diversity. 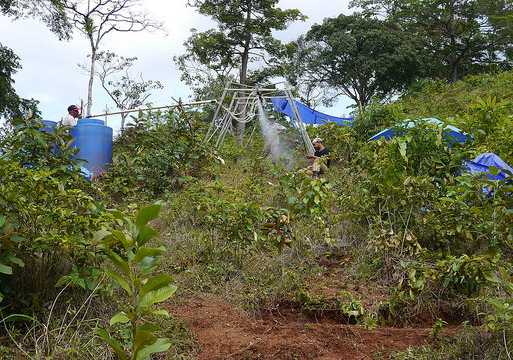 “This NSF award fits into the concept of smart reforestation and validates Agua Salud as a leading, innovative project offering a deeper understanding of tropical hydrology and the impacts of land-management practices on ecosystem services,” says STRI Director Matthew Larson. The STRI Agua Salud (means “healthy water”) project began seven years ago as a long-term, landscape-level experiment to understand how land-use choices in the Panama Canal basin will affect water availability, carbon storage, soil fertility and biodiversity. These are vital environmental services likely to be affected by climate change in coming decades. The project builds upon 100 years of Smithsonian tropical forest research in the Panama Canal basin. Starting with his days as a researcher at the University of Connecticut, Ogden has conducted hydrology research in the Chagres River area in central Panama for the past decade. “I’ve been there (for research) for 12 years. It’s a very exciting place to work,” says Ogden, noting the Panama Canal’s 100th anniversary was Aug. 15. Ogden will present a talk about this latest project at the American Society of Civil Engineers Annual Conference during October in Panama.